Nominated by Franklin D. Roosevelt on January 5, 1939, to a new seat authorized by 52 Stat. 584. Confirmed by the Senate on March 7, 1939, and received commission on March 9, 1939. Served as chief judge, 1954-1959. Service terminated on December 13, 1963, due to death. Petruck, Peninah, ed. Judge Charles Edward Clark. New York: Oceana Publications, 1991. Charles Edward Clark photographs and clippings, 1929-1963; 1 box. 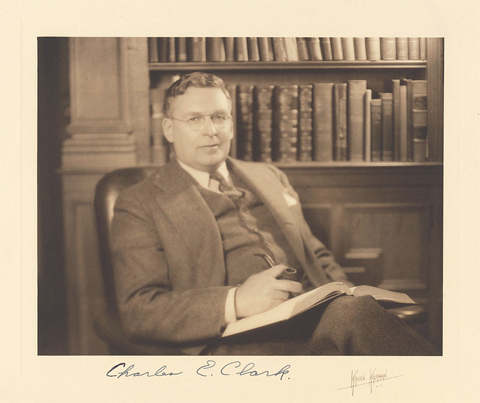 Charles Edward Clark papers, 1907-1967. 56 linear ft. (140 boxes, 1 folio); finding aid; collection contains Clark's personal correspondence, his files for the Committee on Rules for Civil Procedure, as well as his case and motion files, docket books, and correspondence from the U.S. court of appeals. Charles Edward Clark; by Kaiden Kazanjian; Photograph; n.d.; Legal Portrait Collection, Harvard Law School Library, Cambridge, Mass., record identifier: olvwork176465. Reference image courtesy of Historical & Special Collections, Harvard Law School Library. Further reproduction prohibited without permission of the library. Judge Charles E. Clark (1889-1963); by Franklin Chenault Watkins; Oil on canvas; 1959; Yale University Law School, New Haven, Conn., ref. #: U.1959.7.